Sea kayaking to a glacier was one of the activities that I was most excited about on this trip (see where we stayed here). I met up with my sister in Alaska last August, around the time that Orcas and Humpback whales are often spotted, so I was eager to find an activity that grouped a whale watching tour with a glacier tour. 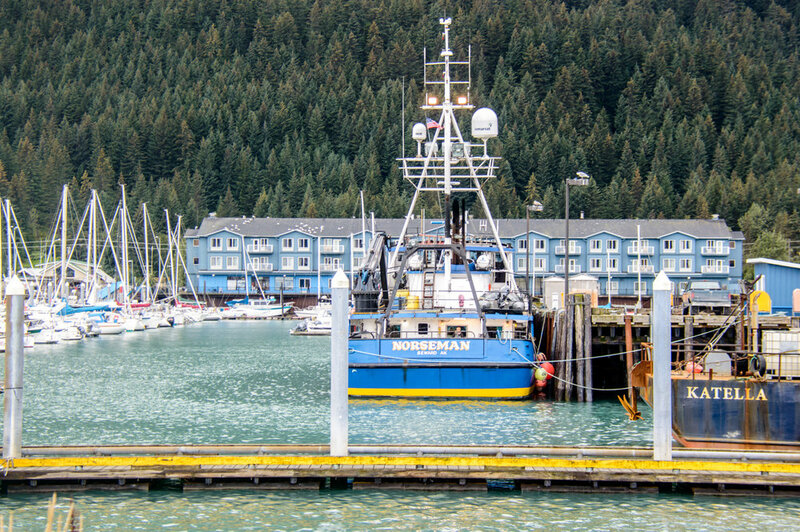 Conveniently, there are several tours out of Seward, which is about two hours from where we stayed in Girdwood. I chose Kayak Adventures Worldwide based off of the reviews that the company took time to look for the wildlife even though it definitely is not guaranteed, but I think any of these ones listed on TripAdvisor would be a great option. This particular tour included 2.5 hours on a comfortable water taxi each way with plenty of opportunities to search for wildlife and view the Alaskan coastline, and a guided sea kayaking tour to the Aialik Glacier. I was pretty intimidated about kayaking out on the open waters, but it turned out to be such an incredible experience! We saw harbour seals and the spout of a humpback whale, but unfortunately the animals did not seem too eager to come out and play. I don't blame them, since the weather was pretty gloomy that day. As I mentioned in my first post, it was cloudy and raining off and on during our whole trip, but especially during our glacier tour. Hilariously, I had put on full makeup that morning and it completely washed off in the rain. Luckily, I was dressed in the best gear available including these boots and leggings, this long sleeve top, this sweatshirt, this headband, this puff jacket and this waterproof jacket. My sister also wore a baseball cap that seemed to really help keep the rain off her face. It's important to make sure your layers are waterproof and not just water resistant. My sister's jacket was only water resistant and she was soaked and freezing by the end of the day. The tour group will rent waterproof boots and layers for anyone who needs them at a small cost. The journey to the glacier was about an hour and a half. Even though we did not see a lot of wildlife, the scenic boat ride showed off the majestic Alaskan coast. Our tour group was less than ten people, so we enjoyed getting to know everyone throughout the trip. One solo female traveler had recently spent several days backpacking and camping up in Denali, and her stories were amazing. To get to Denali, you have to take a bus (literally, a school bus) six hours inside the park to the closest campground. No cars are allowed past the initial entrance. Most people do this all in a day, with small hopes of catching a glimpse of Mt. McKinley and various wildlife to little or no success. However, according to this girl, if you stay a while, the weather changes quickly and you might have a totally perfect day in the park. Her pictures were incredible, so keep this in mind if you try to fit Denali into your trip. If I make it back to Alaska, I definitely plan on giving myself plenty of time in the park. Once we arrived at the drop off point for Aialik Glacier, our guides unloaded all of the kayaking gear and then split us into two small groups so that they could more easily guide us to the glacier. Before climbing into the kayak, our guide taught us the proper way to row, how to attach our kayak skirts to keep water from filling up the boat and how to detach it if by chance the boat flips over and we need to get out. My sister and I shared a kayak and had a surprisingly fun time rowing together. It was definitely a lot of work, but as soon as I remembered the correct rowing form our guide had taught us, it became easier again. Immediately upon arrival, we started to hear the unnerving clap of ice breaking off of the glacier and crumbling into the sea. It sounded like the sharpest clap of the thunder, when you know the storm is close. We kayaked a few miles to the glacier, but we weren't allowed to get any closer for our safety. After watching the incredible glacier show of ice breaking off, we kayaked around some icebergs, saw a harbour seal, and then navigated through some sea caves on our way back to the drop off point. Inside the caves, we tasted a plant that they called the aloe vera of the sea. Thankfully, we accepted the hot chocolate they had ready for us when we kayaked back to the drop-off point. I highly recommend this tour if you are the adventurous type, who enjoys physical activity and doesn't mind getting a little wet. Basically, if you like hiking, you will love this tour. However, if you prefer glamping and seeing nature from a drier point of view, I recommend checking out the glacier cruises. These cruises are actually cheaper, provide a steak and seafood meal, and get really close to the glacier because they are in a much larger boat. Both are great options, and I hope you will have far better weather than I did! Check the historical climate data here... based on these charts I would probably go back between January and early July.